She came to us because she wanted, desperately, to be a mother. And we welcomed her, not knowing all that this would entail. 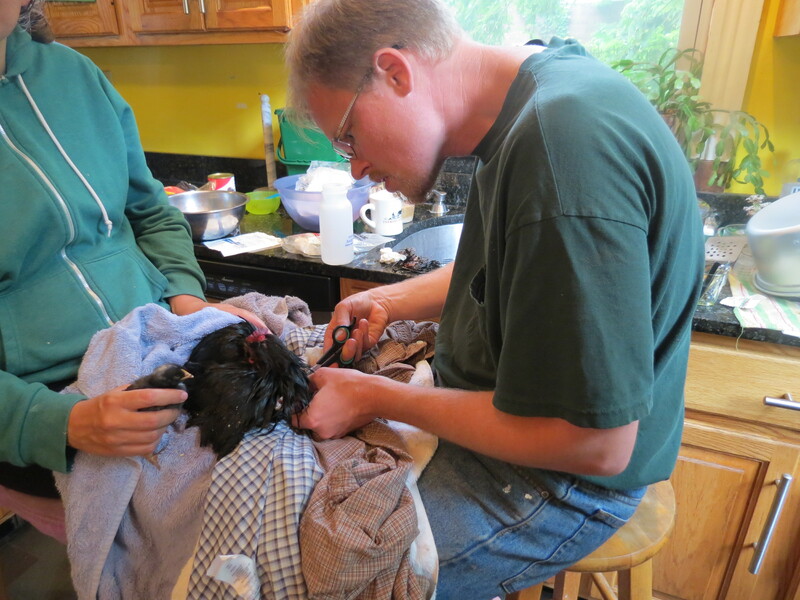 She was our neighbor’s chicken, a black Astralorp hen named Shadow. And she was broody. It was her instinct, and her obsession. She gathered a clutch of eggs, and sat on them. She warmed them and turned them. And sat on them. For weeks. She wouldn’t leave her eggs to eat or to drink water. She fought any pesky humans who tried to pull her off. And so Shadow sat. And sat. And drove her pesky humans crazy. The only real way to break a hen of her broodiness is to give her what she wants. Chicks. And if you live in the city and can’t have a rooster, one way to get chicks is to order them through the mail. Her first owners weren’t up for chicks, not this year, and so she came to be with us. A few weeks after she moved in to our coop, a grinning postal worker delivered a peeping box. Fifteen fuzzy babies, only a day and a half old. 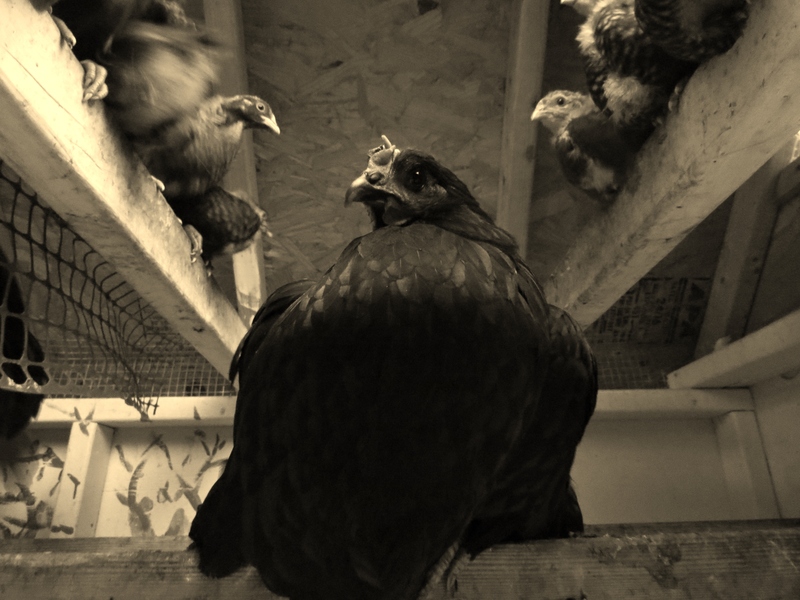 The night, when Shadow was fast asleep, we reached under her warm body and replaced eggs with chicks. In the morning, a new set of instincts kicked in. She was, as we expected, an excellent mother. She protected her chicks from the other hens, and taught them important chicken life skills like how to take dust baths. During the day they rode around on her back, and at night they disappeared under her wings. She had beautiful instincts. But then, one rainy night when the chicks were just two weeks old, everything changed. It was my job to lock up the coop at night, and one night I forgot. At four a.m. we were awakened by chicken screams. We ran out into the rain and discovered the grisly remains of a raccoon attack. Feathers and blood were everywhere, and the remaining chickens were huddled in the back of the coop. There were peeps coming from under a black chicken, but it was impossible to tell how many were left. We locked up and gave up until daylight. When the sun came up, we returned to the coop. As the traumatized chickens staggered down the ramp, I counted and prayed that Shadow was among the survivors. 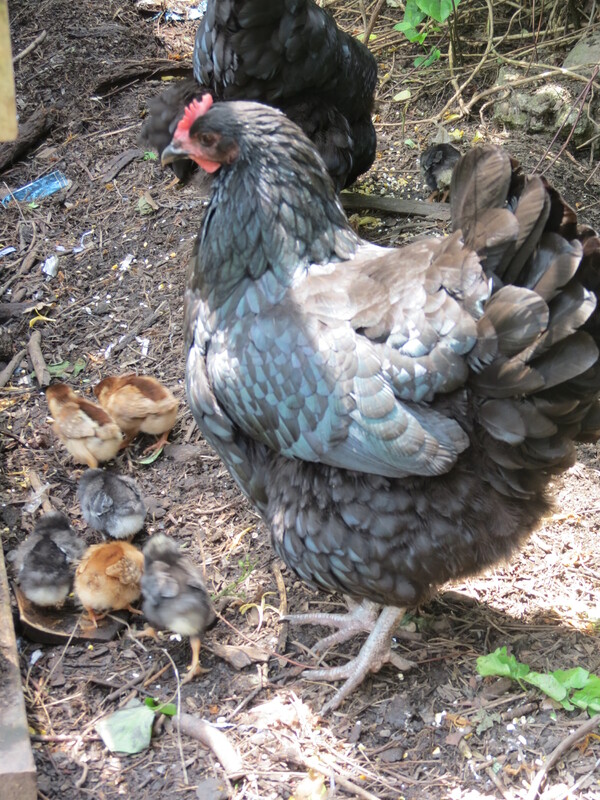 The chicks were following a black hen, trying to jump up on her back. Was it Shadow? No, she ignored them and shook them off. A red hen pecked at one of the chicks and I waited for Shadow to respond. There was no response. Five chicks and two hens were missing. And Shadow was one of them. We locked up the chicks to keep them safe from the other hens, and I went to our bedroom to cry. I kept picturing her with the chicks peeping out of her wings. Why hadn’t I locked up the coop? How could I have forgotten? Everything in me longed to turn back the clock, but I couldn’t. She was gone. And so we ran outside. A wet, bleeding black chicken was staggering across the yard. She could barely walk. Half her feathers were gone. Her back was ripped open, one of her wings was hanging down. And so we brought her into the house and wrapped her in a towel. My husband is not a surgeon, but he is a cook, and let’s just say that he’s worked with chicken before. We found a needle, thread, distilled water, and hydrogen peroxide. We got to work. She didn’t seem to feel the stitches. She was barely conscious, but every time she passed out, we brought a chick in from the coop. As soon as we held it in front of her, peeping, she would wake up and start clucking at it. We kept going. Three hours later, we returned her to the coop and the chicks surrounded her. One jumped up on her back, right on her stitches, and I cringed. But we couldn’t separate them. They were the reason she returned. Her instinct drove her back, and-as it turned out-her instinct would keep her alive. Shadow was, and continues to be, the mother hen. Categories: pretending to live in the country | Tags: chickens, chicks, mother hen, raccoon attack, Shadow, urban farming | Permalink. Yes, I know what some of you are thinking. This is a scientific statement, and I stand by it. I will now present my evidence. On my very own street, which happens to be 5 blocks long, there are a total of 30 people of predominately European-American heritage. 30 white people out of like hundreds of people total. Now. TWENTY-THREE of these people are chicken owners. Twenty-three out of thirty, that’s SEVENTY-SEVEN PERCENT. Even accounting for the fact that thirteen of these poultry proprietors are under the age of eighteen, there is still a trend in our midst, and I feel that it is my duty to present this warning. White people who live in predominately African-American neighborhoods are sometimes regarded as harbingers of gentrification, conquering houses and then blocks one L.L.Bean catalog at a time. But oh no, none of my Caucasian neighbors can afford L.L.Bean. We are not the wealthy. We are the wanna-be farmers who also wanna walking access to good Mexican food, Vietnamese soup, and locally-roasted coffee. We are the wanna-be farmers who don’t really wanna a barn full of smelly animals, just a small coop of chickens-with-cute-names. Wanna see their pictures on facebook? We are the wanna-be farmers who wanna our children to be exposed to real agriculture and gain some good immunities to boot. These are ideas we got from NPR and Michael Pollan books. These are ideas we like to talk about over 5 dollar bottles of red wine or scones that we bought at the farmer’s market. These are ideas that we will clean out a chicken coop for. And so beware, my neighbors, my dear friends with more melanin that I. Beware, because we are a bit naive. We will order baby chicks in the mail because our parents wouldn’t let us have them for Easter when we were seven. We will coax them though their oh-too-brief chick-hood, but then they will grow up, and then they will escape every single day. Multiple times. We will chase them down your very own city streets. Thank you for your patience. Thank you for your phone calls (“Um, Miss Jen, your chickens are out again”), your knocks at the door, your forbearance with the early-morning noise (they’re not roosters, but still…), and for feigning excitement when our children show you how they can catch them for the twelfth time. I wish that we could give eggs to everyone on our block. But the darn chickens keep hiding them in the bushes. Categories: Uncategorized | Tags: chicken coop, chickens, gentrification, humor, Michael Pollan, NPR, race, urban farming | Permalink. Mama, You No Eat Animals! Just in case you’ve already discussed the VP debate and the Steelers’ loss this morning, I thought that I would introduce a cheerier topic. No, silly, I’m not talking about my own chickens. Didn’t you read my “Chicken Choices” post from a few weeks ago? I am talking about chickens that I don’t know personally. The ones that I eat. My husband and I have an overly complicated relationship to meat that we are attempting to pass along to our children. Depending on your perspective, you can think of us as thoughtful or hypocritical, but our basic premise is this–know the farmers, know that the animals were treated well, and enjoy the hamburger. In practice, this requires two extra freezers and a host of dedicated farmers. Our annual quarter-cow comes from a dairy farm in Williamsburg, Pa, we buy goats and lambs from teenagers at the Butler 4-H livestock auction, and chickens and pigs come from Lamppost Farm in Eastern, Ohio. (No, we do not buy all these animals every year.) Lamppost even hosts chicken butchering/processing weekends that we have participated in. Yes. Me. Killing a chicken. Because you see, I have been eating chicken for three decades. Our farm network is only one piece of our complicated relationship to meat, but probably the most noteworthy. Noteworthy, but as it turns out, not at all impressive to our three-year-old. Every early August we take our children to the Butler Farm Show and visit all the animals. In the evening, after the girls have gone to Nana and Papa’s house, we return to the Farm Show to bid in the livestock auction. We see this whole day as a learning experience for our children, and attempt to talk with them about all things related to farm animals. We try to translate things like sustainable practices and ethical treatment into preschool language. We meet farmers. We ask questions. All of this may have been a huge mistake. But I do. And so, the conversation continues. Just… please… don’t bring up the bunnies. Categories: Uncategorized | Tags: chickens, farm show, farms, meat, motherhood, sustainable meat, vegetarianism | Permalink. 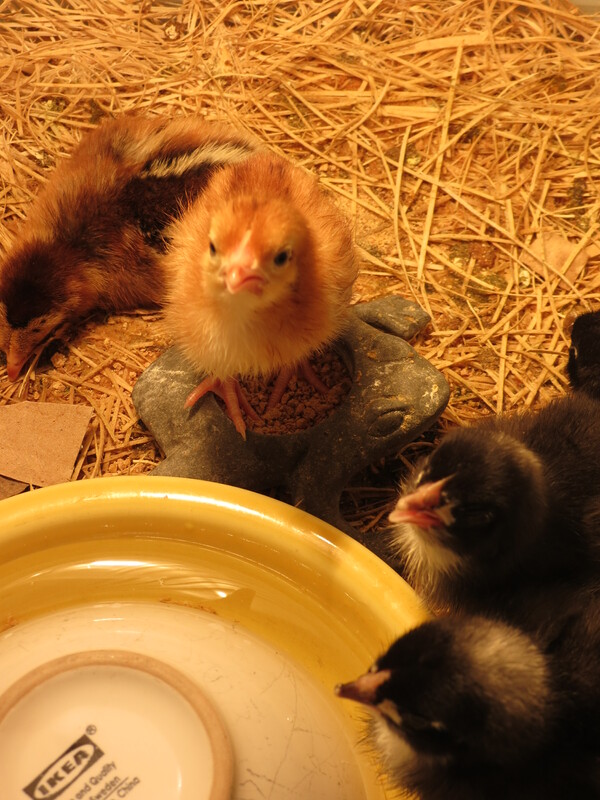 Are your chickens farm animals or pets? I will give you our answer in the form of a quiz. One day, a peregrine falcon discovers a new protein source in our backyard. He does his amazing diving-thing and soon has a mouthful of feathers. The chicken is too big for him to pick up, but he digs his talons in until a neighbor alerts my husband and he comes running. The falcon retreats to the porch roof, the chicken runs under the playhouse and the children run wild. The chicken (once coaxed out of hiding) is discovered to be severely wounded with several gaping, bloody gashes. 1) Ignore the chicken, hope for the best and go out for curry. 3) Run the chicken into the kitchen as if we were poultry paramedics, shouting things like “get the hydrogen peroxide!” and “where’s the sewing kit?”, and then proceed to spend TWO HOURS giving the chicken TWENTY-FIVE stitches, with breaks in which we hand-feed the chicken raisins. Complete our task by applying liquid band-aid to all the suture spots, with a grand finale of blowing on the chicken’s rear-end for five minutes in order to dry the liquid band-aid goo. I’m still a little winded. Categories: Uncategorized | Tags: chicken, chickens, curry, farm, sustainable meat | Permalink. In my late teens and early twenties I spent four summers working at Lutheran summer camps–as kitchen staff and counselor, in Pennsylvania and North Carolina. During these formative years, a fixture in my life was a woman named Mir. Mir was the environmental education director at both of the camps I worked at (I essentially followed Mir and her camp-director-husband to North Carolina). She was as short as her name, perpetually wearing hiking boots and packed with enthusiasm and energy for the natural world. During the afternoon “activity time” I would sign my cabin up for one of Mir’s offerings. She offered a slew of options, but my favorite was “Creek Critters.” It was a simple concept. We would gather at the creek and Mir would give us small plastic containers and largish eye-droppers. Then we were set free to gather water samples and whatever critters we could corral (no water snakes please). The samples would go under low-power microscopes and campers would watch tiny creek-dwellers dance across the slides. Mir would congratulate each find as if the camper had discovered a new species. It was bacteria and little bugs, but it was really really exciting. The best part was the end. After we had carefully released our critters, Mir would stand at the bank of the creek and announce Psalm 104. “Oh Lord, how manifold are your works! In wisdom you made them all; the earth is full of your creatures.” The campers–and I–were transfixed. “Yonder is the sea, great and wide,” she indicated the creek with a grin and a wide sweep of her arm, “full of creeping things both small and great.” Her eyes would shine as she exhorted us to take care of all that God had made, and we would return to the cabin with her words ringing in our ears. It’s been more than a decade since I stood in those woods and heard Mir pronounce God’s manifold wisdom over creatures “great and small”, but I’ve never completely lost the sense of wonder that accompanied her words. It came back to me this week as I was standing in my backyard, watching a swarm of children play and argue and run and fall, grinning as the goofy chickens shook and pecked and flapped and clucked, and wondering how so much life could be contained in one city backyard. And yes, I did just compare my children to bacteria. Categories: living with housemates, pretending to live in the country | Tags: cats, chickens, housemates, motherhood | Permalink.